A wonderful altered card from a Dutch postcrosser. 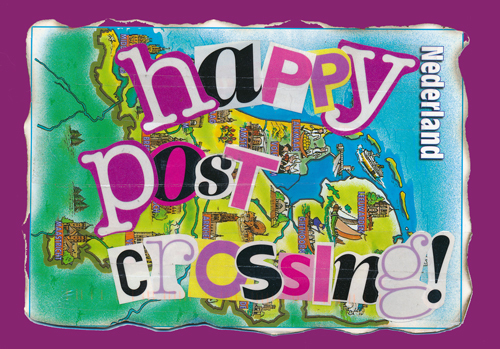 She writes, "I really enjoyed pimping the postcard." Indeed - the corners were carefully burned and the back of the card has lovely coffee stains on it as well as a postcrossing stamp. Thanks so much for creating this work of art! 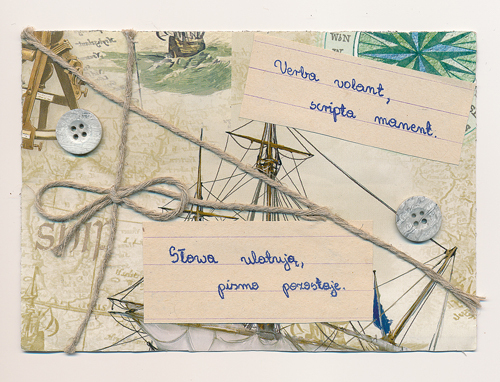 A beautiful postcard from a Polish postcrosser. I love the use of jute, buttons and text! 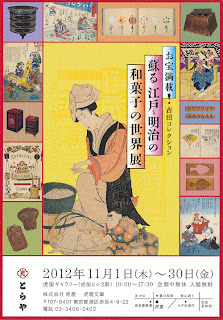 This is a Toraya card, advertizing an exhibition of the making of wagashi (Japanese sweets). I never made it to the show but loved the card. 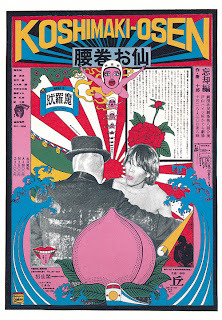 I happened to attend the opening of the Yokoo Tadanori Museum of Contemporary Art in Kobe. It was a beautiful, new building but I wasn't too impressed with the selection of his works. 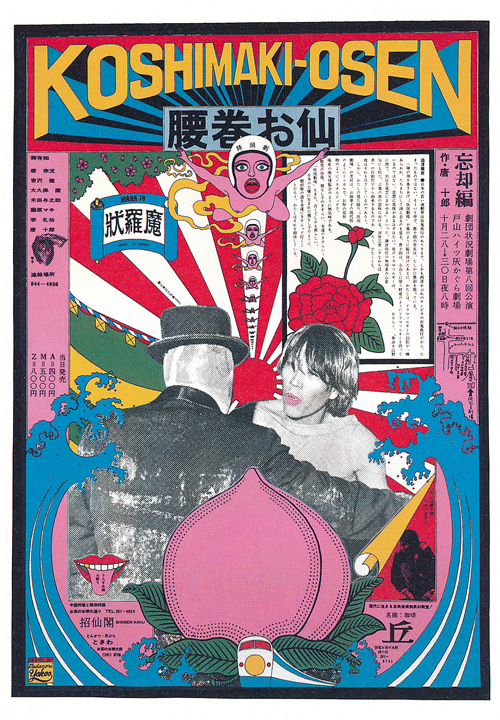 I wanted to see more of his graphic collage work, like this postcard's. Instead, there were a lot of repetitive paintings of a female diver, and a woman openly drooling. I didn't know if he was trying to be droll or fetishistic, but they didn't work for me. Whenever my mother and I walk the Ginza, we stop at Toraya for something sweet. 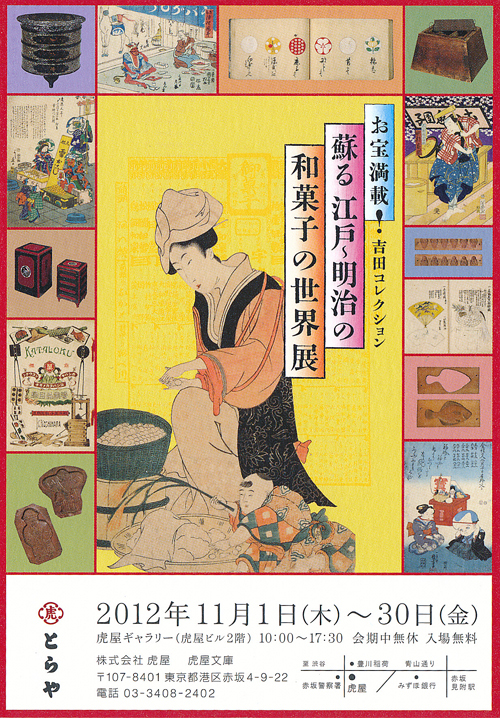 They specialize in adzuki-based sweets that can be enjoyed with matcha or coffee. This time, they had seasonal chestnuts on the menu, so that is what I ordered. 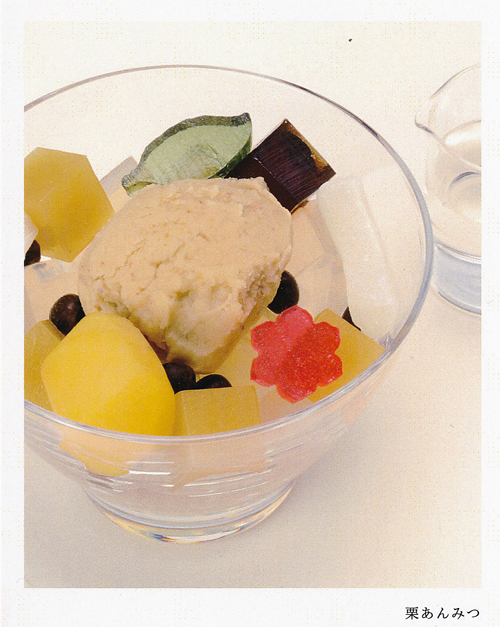 The glass bowl comes filled with jellied agar cut up into flowers, leaves and cubes, peeled chestnuts, and chestnut puree, and azuki beans. I enjoyed it with a frothy cup of bitter matcha. My mother enjoyed the traditional yokan with matcha. It was such a pleasure to be in Tokyo once again! I just returned from a family visit to Japan. 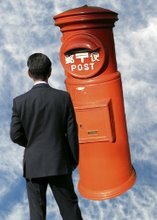 As usual, I was on the prowl for interesting mail-related items. It is sad that the country is devoid now of the elongated red mail boxes, though I found one painted over in a ghastly beige tone. 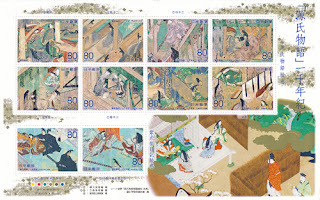 Japan post often sets up pop-up post offices in surprising places, and this is where you can purchase gorgeous commemorative stamps. I found a postal van parked on the back footpath of Kyoto's Kiyomizu temple. Two earnest postal workers had a spread of gorgeous stamps on their folding table. No one seemed to notice or care, but I made a bee-line. 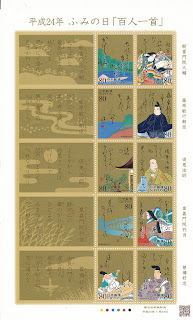 I was delighted to find the Tale of Genji stamps, issued in 2008 to commemorate the 1,000-year anniversary of Lady Murasaki's novel. 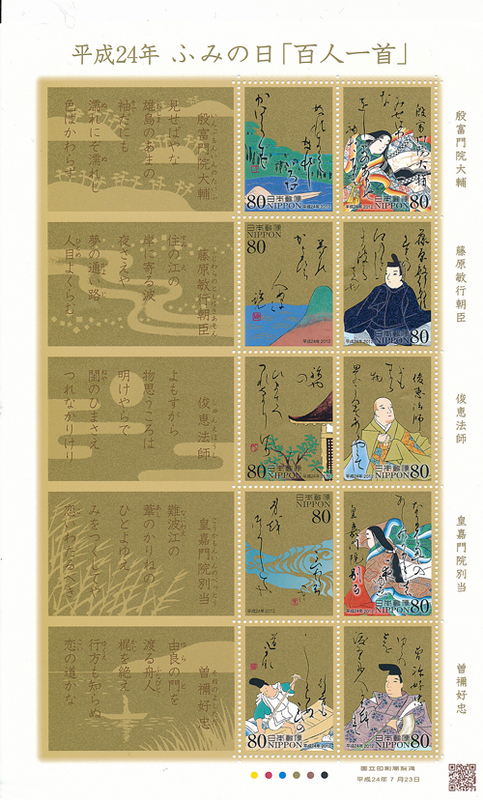 The equally fabulous hyakunin isshu stamp provides portraits of 12th century poets, the poems in script, and the text reproduced in standard Japanese.